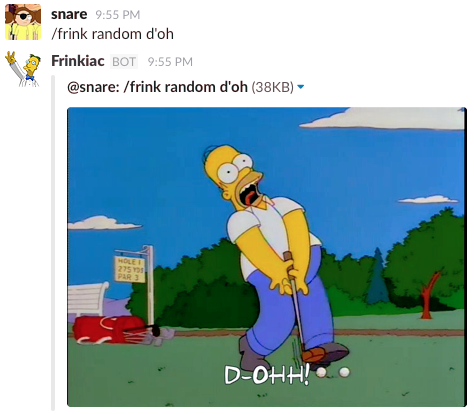 Frinkiac and Morbotron apps for Slack. Frinkiac is a neat app for generating image memes and animated GIFs from The Simpsons. The Frinkiac Slack app provides a mechanism for querying Frinkiac from within the Slack client. Morbotron is like Frinkiac, but for Futurama. The Morbotron Slack app provides a mechanism for querying Morbotron from within the Slack client. 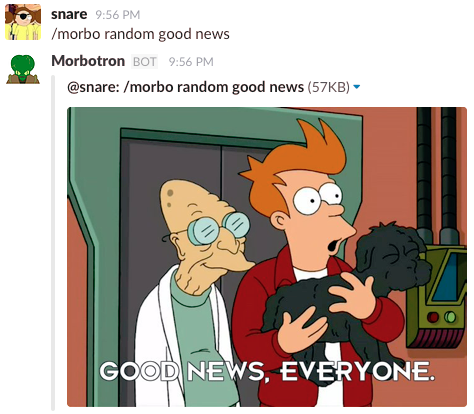 Note: snare did not build Morbotron or Frinkiac, just the Slack apps. Please direct all enquiries about (and internet hugs related to) Morbotron and Frinkiac to their developers - the real heroes of this story. However, if you have feature requests, comments, insults, death threats, etc. for the Slack apps, feel free to open an issue on GitHub. If, for any reason, you're not completely satisfied, I hate you. Anecdote accepted. Snappy comeback not found.